Anna Wright ’11 died in a single-vehicle accident last summer, leaving behind grieving friends and teammates at University of Lynchburg. They are keeping her memory alive by raising money to drill wells in northern Uganda. In May, a group of nine LC students, including four women’s soccer players, traveled with Dr. Olsen and Rodney Suddith, executive director of Sports Outreach Institute, to Uganda for a service learning study abroad experience. The group helped with brick construction, participated in sports ministry through soccer games, completed community work in various communities, taught public health training, and watched as a deep-bore freshwater well was drilled. On May 25, 2011, that well was dedicated to Anna. Anna was a health promotion major from Ashland, Va., scheduled to graduate in May. 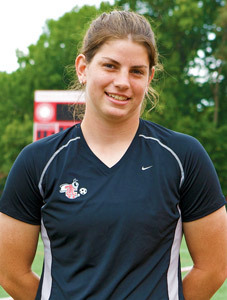 She was the starting goalkeeper for the women’s soccer team and earned All-State honors in 2009. Her loss has left gaping holes around campus. On March 1, nearly 180 students participated in a 5k run/walk in her memory. Check out local television coverage of the run by WSET and front page coverage in The News & Advance. Anna’s parents, Darrell and Nancy Wright, and several other family members participated in the 5k. Since the tragic loss of their daughter, they have become enthusiastic about the prospect of helping Anna’s soccer coach, Dr. Todd Olsen, in his efforts to improve the lives of villagers in Gulu, northern Uganda, by providing clean water. Dr. Olsen works with Lynchburg-based Sports Outreach Institute, which uses soccer and other games to improve lives around the world. LC and Sports Outreach co-host the annual “Gifts for Gulu” races on Shellenberger Field, held this year on March 12. Julianne Mayes ’11 launched a new recycling initiative last fall in memory of Anna. The “Be the Change” program aims to reduce the amount of waste that students produce while raising money for the wells. Students collected 1,587 pounds of aluminum cans (that’s 50,000 cans). Both the men’s and women’s basketball programs contributed all the ticket sales from a double header on February 5 to Anna’s Well. The women’s soccer players also collected donations in the stands during both games. A total of $854 was collected. LC and Sports Outreach also presented a “Strategies for Life” week of events March 28-April 3, to raise more awareness about health-related issues, and more funds for projects in Gulu and Haiti.